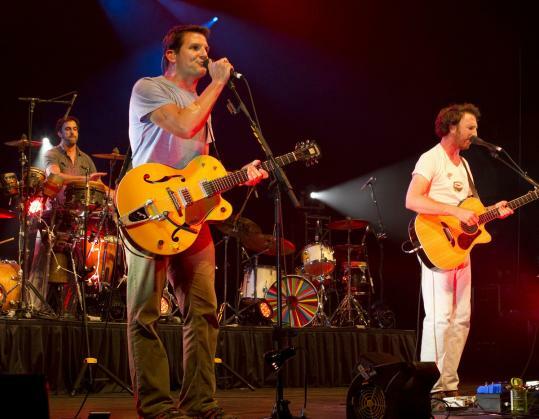 ‘We’re so bad at playing rock stars, it’s ridiculous,’’ said Guster frontman Ryan Miller six songs into the band’s set Friday night at the Bank of America Pavilion. In an attempt at a very simple, classic concert maneuver - all three guitarists assembling at the lip of the stage to rock out - Miller, bassist Luke Reynolds, and singer-guitarist Adam Gardner managed to get comically tangled up in each other’s cords. But the utter “adorkableness’’ of that moment, and others like it during the winning 90-minute performance - including forays into keytar solos, the donning of a disco ball as headgear, and a sincere Foreigner cover - has always been a part of the appeal of the Somerville-spawned pop rock group that began life 20 years ago as an acoustic trio at Tufts University. The group, since expanded to a quartet in the studio and occasionally a sextet live, with musical assists from crew members, notched another terrific local performance, traversing a catalog that balances classic pop songcraft and wry humor. Given the band’s antics at previous Boston shows, Friday’s grand finale did not disappoint. After announcing that the next song would be a first attempt, the cool synths of Foreigner’s ’80s power ballad “I Want to Know What Love Is’’ wafted over the sound system. Following well-sung verses from Miller and McMahon, drummer-percussionist Brian Rosenworcel came to the microphone for his customary, spectacularly tuneless verse and then ceded the stage to Will Forte of “Saturday Night Live’’ fame. “MacGruber’’ crushed Lou Gramm’s every vocal nuance while slowly ripping off a series of Guster concert T-shirts, ultimately revealing a torso and back emblazoned with “Guster’’ in black marker. At one point early in the evening, Miller had shouted, “Yay! Fun! Music!’’ It was a fitting summation of a lovely night. The charming and vocally gifted McMahon led Jack’s Mannequin through a lengthy set of likable piano-driven pop rock that included a preview of songs, including the driving “Racing Thoughts,’’ from the band’s forthcoming album, “People and Things,’’ out Oct. 4.